Each week, we comb through the guts of The Walking Dead, much like a horde of hungry walkers, to bring you the episode’s best moments, surprises, and other post-apocalyptic curiosities. This week: Negan stops a coup d’état, Negan performs a coup de grâce, and Gregory flees the coop with some intel. Best reminder of life before the apocalypse: This far into The Walking Dead, the idea of a young Carl eating pizza on Friday nights, going to church, and spending quality time with his grandparents is positively foreign. But his letter to Rick was a heartfelt reminder that there’s more to life than killing zombies and warring with your fellow humans. Here’s hoping that Rick and Negan realize this, however unlikely that seems. Bad omen: If Gregory calls you a good leader, you’re probably not. Crossfire: There was so much double- and triple-crossing in this episode that our heads are still spinning. We definitely got caught up in it. Meta-foreshadowing: Dwight and Negan move a dumpster, and then later, during the coup, Negan steps out from behind the dumpster to quash the meeting. What is it with this show and people hiding around dumpsters? Biggest questions: How is Gabriel still alive? And will the infection ever kill him? Easiest bet: If everybody’s Negan, that means when Simon and Negan fight, Negan is going to win and Negan is going to lose. But hey, they’re giving 10:1 odds on Negan, so might as well take that bet. Biggest risk: If you need to pass important intel to Rick and Co., Gregory is the last person we’d trust as a messenger. Biggest surprise: Wait, he actually brought it to them?! Best escape tactics: Eugene might have given up the carbs and protein from his mac-and-garlic-sards, but inducing vomiting provided quite the ingenious escape from Rosita and Daryl. Hiding under human ashes is just the cherry on top of our nope-sundae. Best transformation: After four years of Eugene being, well, Eugene, it was good to see him driven with purpose. Sure, it’s misguided, but we’re glad that our pudgy, verbose friend finally managed to grow a spine. We just really wish it wasn’t at the expense of being twisted and evil. Death watch: Of course, since Eugene has gone through a massive character development, he’s automatically on the short list for a possible series finale death next week. 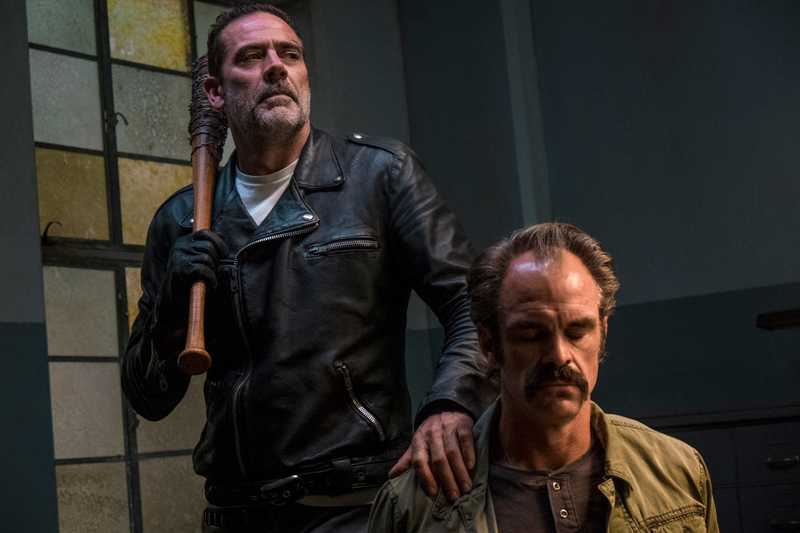 Most disturbing image: Negan did pick up Laura at the end of last week’s episode, just as we predicted, so Dwight was finally revealed as a traitor to the Saviors. But rather than giving Dwight a kiss from Lucille, Negan took the double-cross one step further by having Dwight unknowingly send a fake attack plan to Rick, revealing at the end of the episode that Negan, in fact, had the upper hand all along. We knew Negan would find out Dwight was a traitor, but we didn’t expect him to quite be so calculating in his response. Best kill: Raise your hand if you were sad to see Simon go. Anyone? We didn’t think so. It was also fitting that his zombified-self ended up tied to the Sanctuary fence. Advice for the future: don’t go rogue and massacre entire communities. Episode MVP: Michonne, for amplifying Carl’s message of peace to Rick and Negan. She’s not only honoring her friend’s memory by making sure his last words are heard, but she’s also the only one forcing Rick and Negan, both of whom are currently bent on destroying the other, to listen to any kind of peace talk. If this situation doesn’t completely go up in flames, she deserves some credit for peacekeeping. And sadly, there wasn’t enough Rick this week to register on the calm/crazy scale, but we’re all assuming this is the calm before the Rick-storm.